"special enough for a special outfit". The dresses are perfect. Thank You!!! From time to time, we will post here the newest items we have added. Click here to visit our 'Our Newest Additions'. The dress arrived safely yesterday! It is absolutely beautiful - and fits her perfectly too! It's exactly what we were hoping for - thank you so very much! You do incredible work. Thank you again!! When you pay this much for a dress for an 8 year old, obviously the expectations are high to start. Still you managed to greatly exceed my expectations, the dress is absolutely beautiful and the workmanship is impeccable. Thank you so much! The First Communion is a very special event in the life of children and their families. The First Communion is also known as First Holy Communion. This is a very important ceremony in the Catholic Church. The First Communion is also celebrated in other Christian churches such as the Presbyterian, Lutheran, and some Anglican Churches. The age of children taking their First Communion is generally between 5 and 8 years. Usually, sometime during the month of May, a child prepares with some intense studies for this step into their church’s family. It is customary, during the ritual, that a girl wears a long white dress along with a white veil or other white headpiece while a boy wears a fancy white or traditional dark blue suit with a white shirt, dress shoes, and conservative tie. 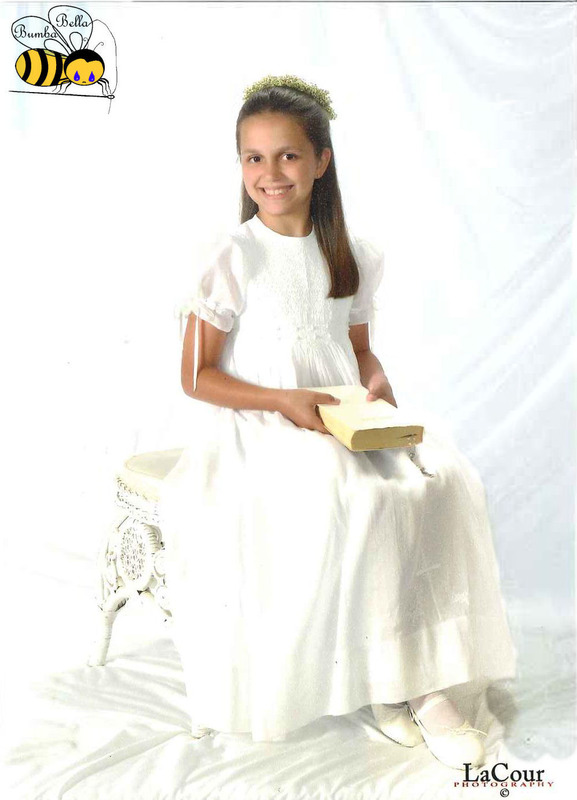 Click here to visit our 'First Communion Dresses'. The flower girl is usually between 4 and 8 years old and is ‘special’ to the bride, the groom, or both. Often the selected flower girl is a niece or cousin, a close family friend, or a neighbor. Some weddings have two (2), three (3), or even four (4) flower girls. Sometimes there is no flower girl at all. The flower girl walks with a basket of flowers, scattering flowers, flower petals, flower stems or potpourri, before the bride makes her trip down the isle. Preferably, the basket is small and wrapped in satin and decorated with ribbons or flowers. The flower girl usually walks down the aisle behind the bridesmaids. On some occasions the flower girl walks in front of (or behind) the maid of honor, depending on the ceremony. Usually the flower girl is no younger than 4 years old as a younger child may become easily confused, or frightened. Girls older than eight may be better reserved for reading something aloud during the ceremony, or even junior bridesmaid. Click here to visit our 'Flower Girl Dresses'. Click here to visit our 'Cummerbands'. I just wanted to pass on my appreciation for making such a beautiful dress. The package arrived yesterday and my daughter absolutely loves it... the dress is beyond my expectations, it's gorgous!!! You are amazing, I will recommend this site to everyone I know!!!! If there is someplace I can post a review for you, please let me know. Thank you very much for the wonderful service. Love it, love it, love it!!!!! The christening or baptismal gown is traditional ceremonial garb for a child being baptized in most Christian denominations. 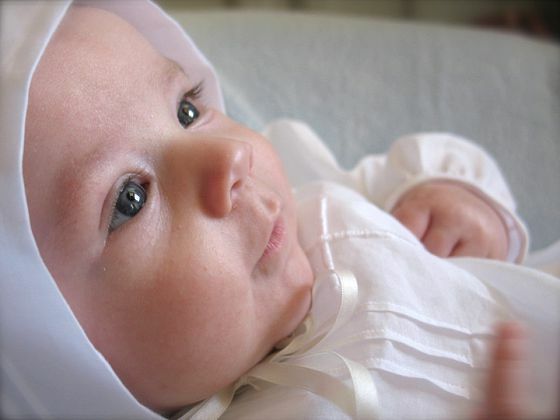 The custom of wearing a christening gown goes back to early Christianity and what was known as “white week”. The white week was a time when newly baptized Christians wore white linen robes to symbolize their rebirth and new life. Today, the child being christened wears a special outfit that is usually white, as this color symbolizes purity, although sometimes the gown is ecru, ivory, or natural. Any family member may buy, donate or make the christening or baptismal gown. In many families, the christening gown is passed from generation to generation. The fabrics most often used are 100% cotton and linen as these fabrics, with proper care and storage, will last for many years. Sometimes pure silk is used. 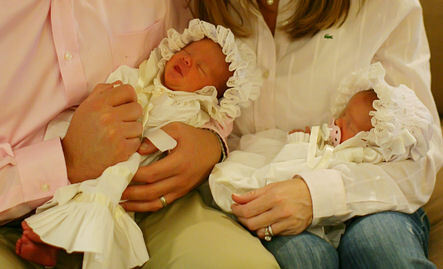 Click here to visit our 'Christening Gowns'. Initially, bonnets were a wreath of leaves and flowers worn to celebrate the coming of spring, the beginning of new life after the long cold winter. In addition to natural flowers and leaves, many material were used to make these decorative wreaths, including paper, fabric, ribbon, hair, feathers, and sea shells. The round shape symbolized the shape of the sun and the path the earth takes around the sun. 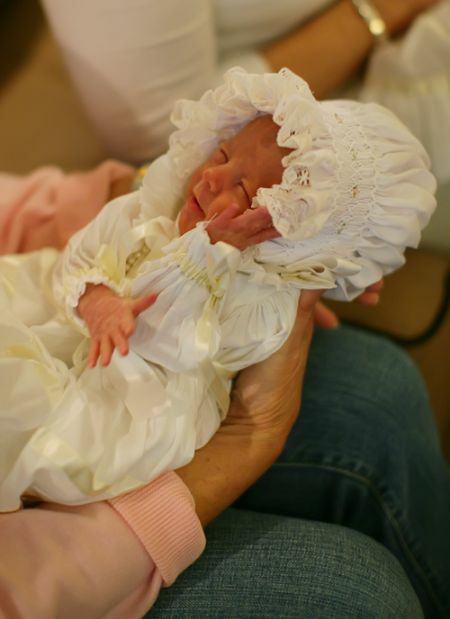 Baby bonnets were made with a wide brim and a deep curtain at the neckline to protect the baby from sun, rain and wind. Recently wearing a baby bonnet became popular and fashonable as babies of the rich and famous were seen wearing baby bonnets. These baby’s bonnets are made using either expensive fabrics or traditional gingham. During the summer, baby bonnets would be made of light weight fabrics such as batiste, In the winter bonnets would be made using velvet, satin, moiré, and heavier materials in addition to being more lavishly decorated. While most of the baby bonnets are designed for girls, there are bonnets or caps designed for boys also. The design of caps for boys is much simpler. These caps are worn when taking baby pictures, and often complement the christening outfit. Babies up to one year old, frequently wear a soft cotton cap to help regulate their head temperature. Baby’s bonnets usually cover the hair and ears, leaving the forehead uncovered, thus framing the face. Most bonnet worn today are soft head coverings worn by babies. Todays bonnets are styled similar to bonnets women used to wear in the 1800’s when bonnets were fabricated from several layers of fabric by women on isolated prairie farms using available material. Click here to visit our 'Baby's Bonnets'. Click here to visit our 'how to make a smocked baby bonnet tutorial'. Here are some babymeasurements that Bumba Bella Boutique uses, as a guide, when making the Preemie and Newborn baby items. This chart attempts to reconcile differences in data available. Please note that the size of the items made using this chart may vary with style. In addition, this information is representative of babies measurements which vary greatly due to innumerable factors. Originally, rompers were only for baby boys and were one-piece suits. Boys rompers were mostly worn by pre-school children, being popular among nursery age children. Rompers are functionally and intended mainly as a play suit. Although some formal rompers are made using fabrics such as velvet and silk, most rompers are made using light weight fabric and are designed to be loose fitting. Rompers come in different styles and closed, almost always, with buttons. Rompers come with different pants and sleeves lengths. Some romper styles have the blouse joined to the pants. More stylish now is the separate two (2) piece outfit, mostly with front buttoning. The light blue fabric is especially popular. Rompers are one of several boys garments that have a front pleated insert. This insert is usually hand smocked although some may be machine smocked or machine embroidered. When the front insert is enhanced with picture smocking, these pictures often use animals, cars, trucks, buses, and trains among other topics. Dressy romper outfits are often used in formal occasions, such as christening ceremonies, dedication, Easter, and Christmas. Click here to visit our 'boys rompers'. When we asked Emily if we could quote her on our website after she said "I love the bonnets, and will probably order more! -- Emily" She said, "Yes you may quote me! I am just thrilled with them!. You may also say that they are a very reasonable price for a high quality product. I order bonnets for my twins online all the time, and it's really hard to find well sewn bonnets for a realistic price. :-) . " Drawn-work Lace is painstakingly made by carefully removing, by hand, some threads from the fabric and then embroidering with other threads to form a lace like fabric. It is strikingly beautiful. The image to the right shows one of the steps in making drawn-work lace using 1/16 gingham fabric. Pulled-thread work and withdrawn work are synonyms. Gingham fabric is especially suitable for pulled-thread or withdrawn work because this fabric is evenly woven. That is, gingham has the same number of threads per inch in warp and weft. 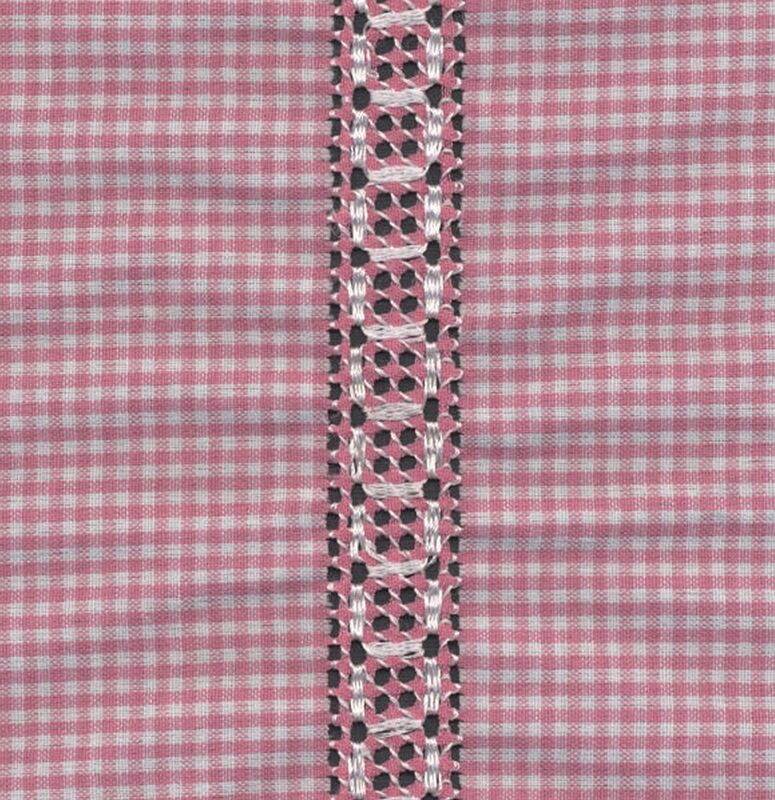 In addition, the weave of gingham fabric is slightly open; too closely woven a weave will cause the fabric to pucker when embroidered. Gingham weave, also, is not too open. The more open the weave the easier the threads can be displaced when the garment is laundered affecting the quality of the item. Click here to view our 'Drawn Work Lace Dresses'. Click here to visit our 'how to make drawn-work lace tutorial'. The dress arrived and is BEAUTIFUL. Thank you for your outstanding service! Just to let you know the dress arrived yesterday afternoon and it is absolutely beautiful! Thank you so much. Each 'Smocked Dress by BumbaBella' is a new Hand Smocked Dress, made in USA by Naturalized US citizens. We are legal emigrants to the USA, from Colombia, and proud of both our adopted country and the heritage we bring with us from our land of birth. We learned our seamstress skills in our land of birth and improved upon those skills here in the USA. The gown fits great! Here are some pictures. I received the dress today and it is better than I ever imagined. Thank you so much for making this vision of mine so perfect. Every dress MUST to be good enough for OUR grandchildren to wear PROUDLY to church on Easter Sunday. Our dresses will NEVER be the cheapest dresses you can find. In fact, our dresses are NEVER cheap. Our dresses are not the most expensive dresses in the world, you can find more expensive dresses. In fact some KITS for do-it-yourself smocked dresses cost more than our dresses. While a dress that YOU make may be more special, our dresses are, we believe, the BEST VALUE available anywhere. 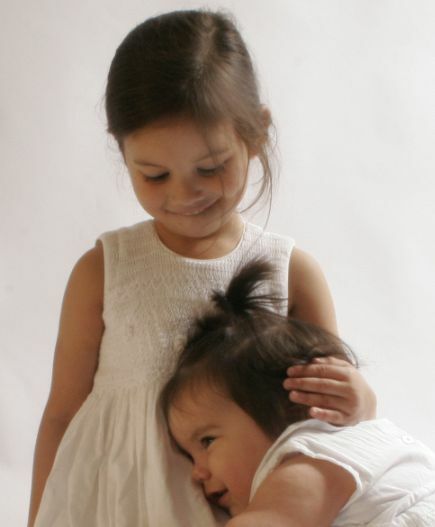 Each dress we make is unique, carefully cut and sewn, pleated, hand smocked and good enough for our own children and grandchildren to wear and to treasure when they grow up. We would be pleased if your children treasured one of our dresses. The dress fits beautifully! Thanks for a 'keepsake'. A cummerbund (sometimes spelled cummerband or cumberbund or cumberband) is an accessory that consists of a broad waist sash, usually pleated, which is often worn with formal wear. The cummerbund was first introduced by military officers as an alternative to a waistcoat, and later expanded to civilian use. The modern use of the cummerbund is an alternative to the semi-formal dress code. The cummerbund is essentially a wide band around the waist, made using fabrics of many colors. Although, initially the cummerbund had the pleats face up, the contemporary use is with the pleats down as its use is purely aesthetic. 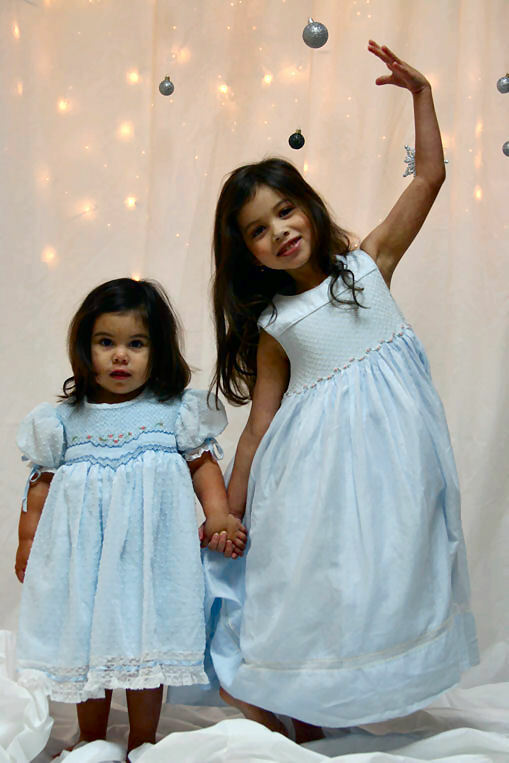 In flower girl dresses, it is common to see colored cummerbunds, often matching, the bridesmaid dresses fabric. Click here to visit our 'Cummerbunds'. and perfect for our little girl's baptism and first birthday. dress to us ... half way round the world in just a matter of days. Thanks very much and have a wonderful Christmas!" If you like our dresses and have something particular in mind, a different color, a different size or a special request, we will be pleased to make a hand smocked dress for you for our normal price plus any additional fully discussed costs for specialty fabrics or yarns required. Normally, all orders take approximately five (5) weeks. Bumba Bella accepts rush orders to be made within twelve (12) days [exclusive of shipping delays] for an additional cost of 25%. A monogram is made from a person initials. Often a monogram consists of three (3) letters however; two (2) letters monograms are also used frequently. When doing monogramming, there is no right or wrong order to the monogram's initials. The most common order for a single lady is her first initial followed by the last initial and then the middle initial. Men most commonly request a straight monogram in the same order as in their name. However, a monogram in the order of first, last, middle is very common also. Embroidery is the stitching. The monogram is embroidered. A complete name can be embroidered. After you choose the font and style, Bumba Bella will contact you before embroidering or monogramming your item to allow you to know how the monogram or name will look before it is stitched. We do all monogramming and embroidering in house. Most of our items are machine washable. However, many embroidered items, such as those done using metallic threads should be dry cleaning. Bumba Bella recommends that when machine washing embroidered items, they be washed inside out on a gently cycle. Embroidered items should not be bleached. Bumba Bella is not responsible for damages occurring by misuse, normal wear or cleaning. Personalized items cannot be returned except in the case of an error on the part of Bumba Bella or if you receive defective goods. Please be sure to double check spelling before placing your order. 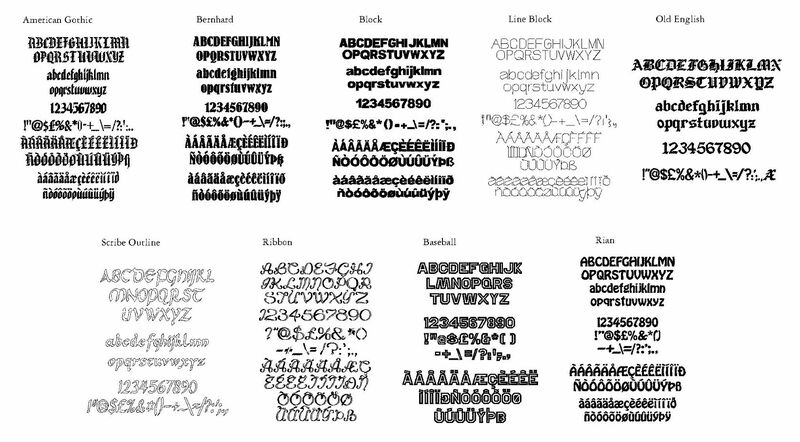 Click on the image below to view the available fonts. Order to embroider the baby's name on your backpack and add a touch of class to your baby's item. Add a touch of class to your baby's meal time at the day-care center with one of our Machine embroidered bibs. Buy a set of 5 and you will no longer worry about the day-care losing one of your baby's bibs. Just to let you know the Bonnets arrived today. I do smocking but have not had time to do much lately. Your work is BEAUTIFUL! Very detailed and much nicer than the online pictures show. Thank you so much. I love your work.